So I've already told you guys about my favorite cleansers Ocean Salt and Angels on Bare Skin and I've let you in on my Eau Roma Water Toner but what about the moisturizer! 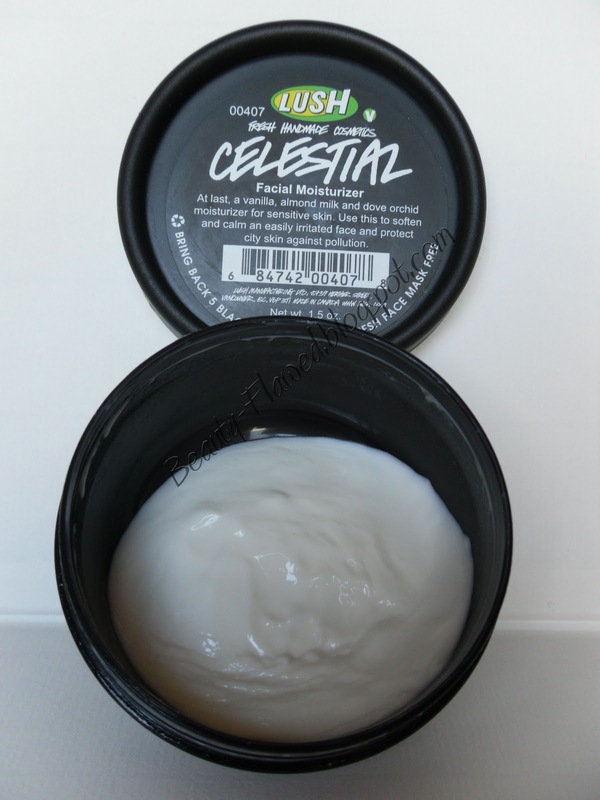 Well Beauty's Celestial is the one I've been using since I started on my Lush voyage. This is a great moisturizer for dry sensitive skin, it delivers enough moisture to your skin without making you look greasy. It also has very simple ingredients to ensure that it doesn't irritate your skin. When I first started using this my skin was in dire need of help it was dry, flaky, and very red. I had a lot of sun damage on my cheek bones from tanning like a Jersey Shore cast member. In combination with the cleanser and toner this has really turned my skin around. It has a light and lovely vanilla scent to it that doesn't irritate, it really smells just like the simple ingredients its made with. I love that it is light and creamy and it only takes a little bit to cover your whole face. You will never find this product to be oily, heavy, sticky, or tacky on the skin. I use three dabs one on my forehead and each cheek and it covers with no problem. The pot I have pictured here I've been using for about six months and I still have a lot left. This product is made with a Orchid Oil that lush makes themselves from fresh Orchids and I feel that really makes the extra difference with this product. A true multi tasker that not only brings dry skin back to life without irritating or making it feel greasy and knocking out redness. This is available in a 1.5 oz size for $23.95. Ingredients: Vanilla Water (Vanilla planifolia), Almond Oil (Prunus dulcis), Almond Milk (Prunus dulcis), Glycerine, Fair Trade Cocoa Butter (Theobroma cacao), Fresh Dove Orchid Extract (Dendrobium), Cetearyl Alcohol, Stearic Acid, Triethanolamine, Methylparaben, Propylparaben. 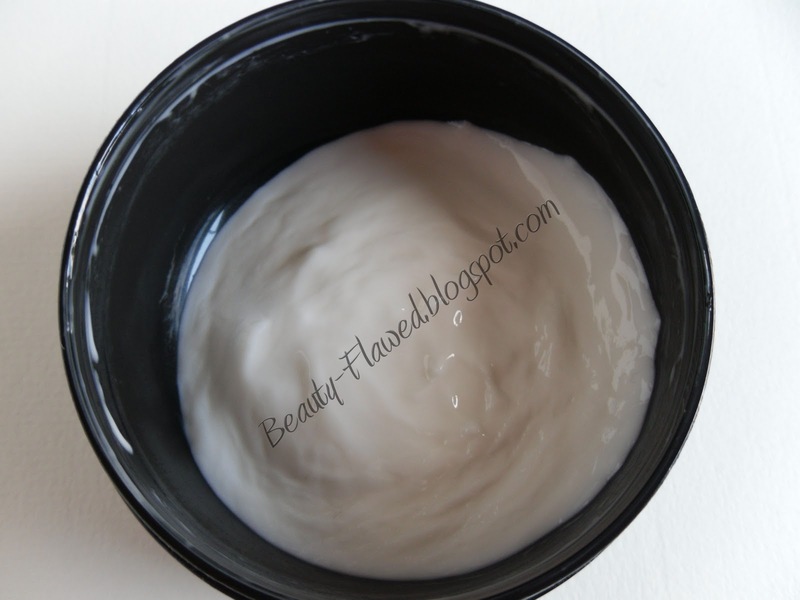 I love this moisturizer and if you have dry sensitive skin you just might love it too. If you have a different skin type Lush has several different face moisturizers to choose from that all offer great simple ingredients. Right now they are offering trial size pots of all their facial moisturizers. You can visit them at Lush Cosmetics: Moisturizers and find the one that's right for your skin type.